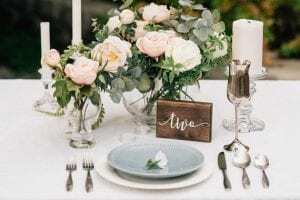 Guests tables are the core of design when it comes to your wedding. Gorgeous linens, stunning florals, and breathtaking china are all ways to dress up a table and make it stand out. But don’t forget the smaller details. 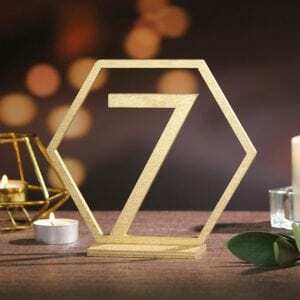 Table numbers are an important part of the wedding design and are vital for your guests to find their seat and enjoy the night. So today I thought I would share some of my favorite table numbers available on Etsy, to help make this decision an easy one. These wood table numbers are perfect for a rustic event! Weather your having a barn or outdoor wedding these are sure to accent your guests tables! Going for a more modern vibe? These glass numbers are just that! Simple yet outstanding they are sure to make an impact on your event! Maybe you have a love for geometrics. These fun numbers are some of the most unique I have seen. They would fit in perfectly with a modern city affair! Sold By: Wedding Table Number Co. 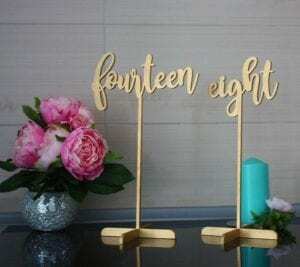 These tall table numbers are sure to be seen at your event. Having table numbers that are raised will allow your guests to easily find their seats. And the beautiful scroll print of these table numbers is one to remember! No matter what you choose be sure to have fun with it. 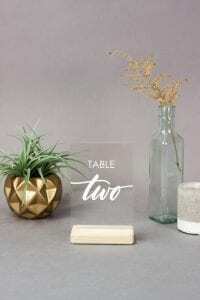 Tables numbers are another way to pull the look of your event together and help make it uniquely you! Want more help planning your big day? Contact Magnificent Moments Weddings, we would love to help you with all details big or small!